A recently patent, published by the US Patent & Trademark Office, has revealed an application from Microsoft containing an Xbox One controller style invention that is targeted at tablet users. The patent shows that the Redmond is developing, or at least considering introducing, a gaming controller that could be split in two. Each half of the controller clips onto Surface tablets and Windows phones, reports PatentlyMobile. Loosely based on the Xbox One controller, this splittable controller reportedly aims to bring the familiarity of Xbox gaming to the company's mobile devices. With the two halves of the controller each said to be able to communicate wirelessly with the mobile device, the patent also shows that the controller will feature asymmetrical analogue sticks, a traditional group of face buttons and a D-pad along with what are presumed to be the Menu and Options buttons in the centre. 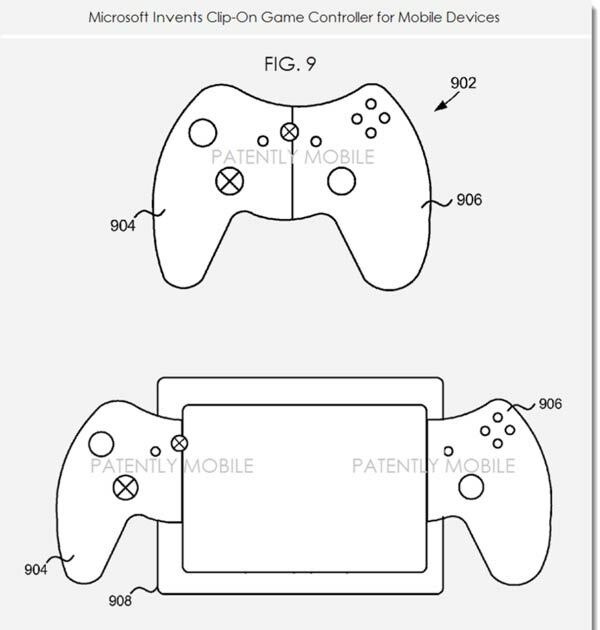 Microsoft also states in the patent that "it will be appreciated that the shape of the games controller shown in FIG. 9 is by way of example only and the games controller may be of any shape." The document goes on to explain "Depending on the size of the touch-screen device and the games controller style, the size of each half may not be much smaller than the touch-screen device to which they attach, e.g. if the touch-screen device is a smartphone rather than a tablet." Microsoft is also interested in including Natural User Interface (NUI) technology in these controllers, which could include voice recognition, touch/stylus recognition, gesture recognition, air commands, head and eye tracking, amongst others. Although the patent, filed back in Q1 2013, does not mention a possible launch date for these gaming controllers, it is interesting to see that Microsoft is thinking out of the box when it comes to tablet and smartphone gaming. The Surface Pro 3 is due to launch in the UK in a month's time, on 28th August, and prices will start from £639 for the 64GB, Intel i3 model.